Preheat oven to 325° F. Line a 9×13 glass baking pan with foil, with ends extending over sides. Spray foil with cooking spray. Finely crush only 24 of the Oreo cookies. (I used my food processor and crushed them pretty fine.) Stir the melted butter into the crumbs. Press mixture onto the bottom of the prepared pan. Beat the cream cheese and sugar until combined and creamy. Add sour cream and vanilla. Mix well. Add eggs, one at a time, until just combined. Chop the remaining oreo cookies and then gently stir into the batter. Pour batter on top of the crust. Spreading out evenly. Bake 35 to 40 minutes or until sides are set and center is almost set. Remove from oven and cool completely in pan. When the cheesecake is cooled, cover with plastic wrap and chill in the fridge for at least 2-3 hours. 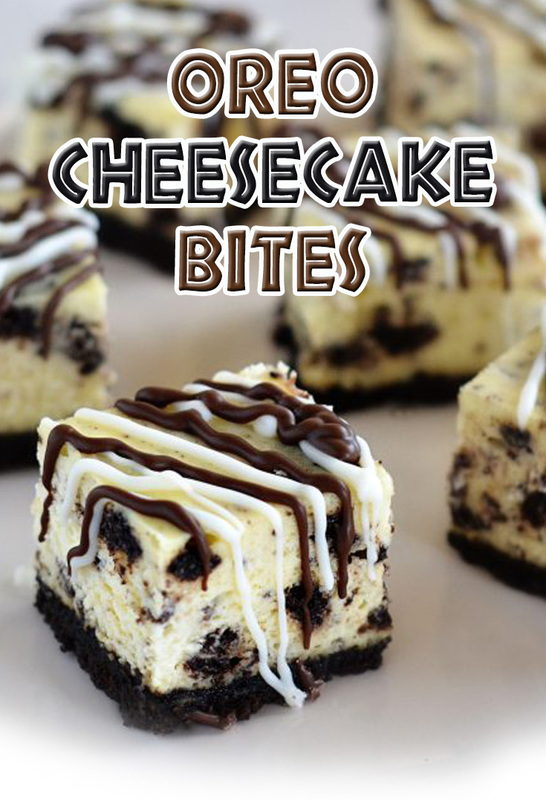 Once chilled, remove the cheesecake using the foil overhangs and cut into bite-sized squares.